2.Place first 6 ingredients in large bowl. Drizzle oil over and sprinkle generously with salt and pepper; toss to coat. 3.Grill vegetables until tender, about 4 minutes for peppers and 7 minutes for remaining vegetables. 4.Transfer to cutting board. Place chicken breasts in same large bowl. Turn to coat with any remaining oil in bowl. 5.Sprinkle chicken with salt and pepper. 6.Grill chicken, until cooked through, about 6 minutes per side. Let stand 5 minutes. 7.Meanwhile, coarsely chop vegetables and transfer to another large bowl. Add basil and vinegar and toss to coat. Season with salt and pepper. 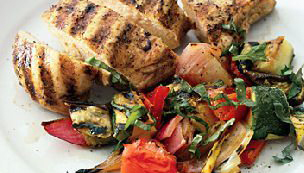 8.Slice chicken crosswise into 1/2-inch-thick slices; serve with vegetables.